The ESV Study Bible (ESVSB) couples the foremost and latest evangelical Christian research and knowledge with the acclaimed ESV Bible text. The end product for you is the most expansive study Bible published to this day, made by an exceptional group of 95 evangelical scholars and educators. For the serious student of the Bible to the reader who just wants to know more, the ESVSB contains revamped notes, maps, illustrations, charts, timelines, articles, and introductions. The ESV Study Bible spans two million words of Biblical text, useful commentary, lessons, and other guiding material—the equal of a 20-volume library but in a convenient, accessible format. You’ll find information on worship, prayer, biblical manuscripts, and personal application helpful as you experience God’s transformational work in your life. 20,000 notes—helping you understand God's Word more and more, and giving answers to common questions. Over 50 articles—to explain the Bible’s authority and historical authenticity, and to equip you with knowledge on biblical archaeology, theology, and finally, ways to apply what you learn in your life. 200-plus charts—placed throughout the Study Notes, presenting wisdom and thorough analysis with distinctive clarity. Over 200 full-color maps—composed with cutting edge digital imaging technology, satellite pictures, and archaeological findings. 80,000 cross-references—for effortless location of crucial words, passages, and themes. 40 all-new illustrations—including full-color portrayals and diagrams of the Tabernacle, the Ark of the Covenant, Solomon's temple, Herod's temple, NT and OT Jerusalem, and more. The ESV Study Bible also provides a wealth of additional resources. The introductions to each book include essential information about the author, date, and place of writing; an extensive chart of key themes; a summary of how the book fits in with the rest of the biblical storyline; a description of literary features; an outline of the book; and a large full-color map showing the setting of the book. Supplemental articles cover topics such as the authority and truthfulness of the Bible, reading the Bible for application, the Bible in worship and prayer, the reliability of the biblical manuscripts, the relationship between archaeology and the Bible, an overview of biblical theology, and many more. 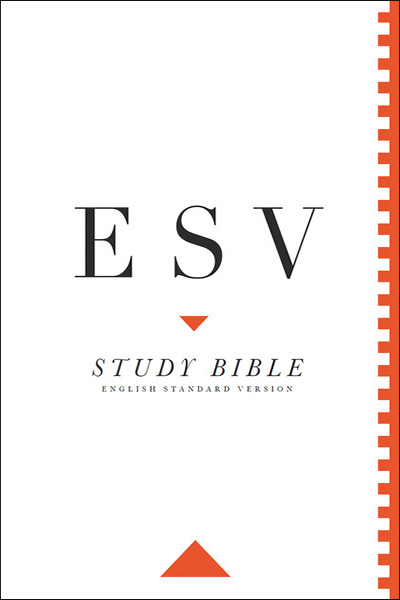 The ESV Bible translation is the basic text used for the ESV Study Bible. The ESV translators focus on word for word accuracy and literary quality while retaining the depth of meaning found in the original Greek and Hebrew texts—making the ESV a perfect base for this Study Bible. The ESV first came out in 2001 after being developed by over 100 biblical scholars from around the globe. Many of those same scholars helped develop this ESV Study Bible. Please note: The Daily Reading Plan included with the print version of the ESV Study Bible is not currently available.